I think most of us are guilty of falling into a rut when it comes to fashion- I certainly am! For probably the past decade I've worn dresses maybe ninety percent of the time. Very few other items of clothing ever get a look into my wardrobe at all, and whenever I'm shopping for clothes I make a beeline for the dresses section. It occurred to me recently that they've become something of a comfort blanket for me, and that I hardly ever switch things up when it comes to my style. While skirts might not seem all that different to dresses this was actually quite a big change for me, the last time I really wore them would have been back when denim mini skirts were in fashion (Im really showing my age now!) 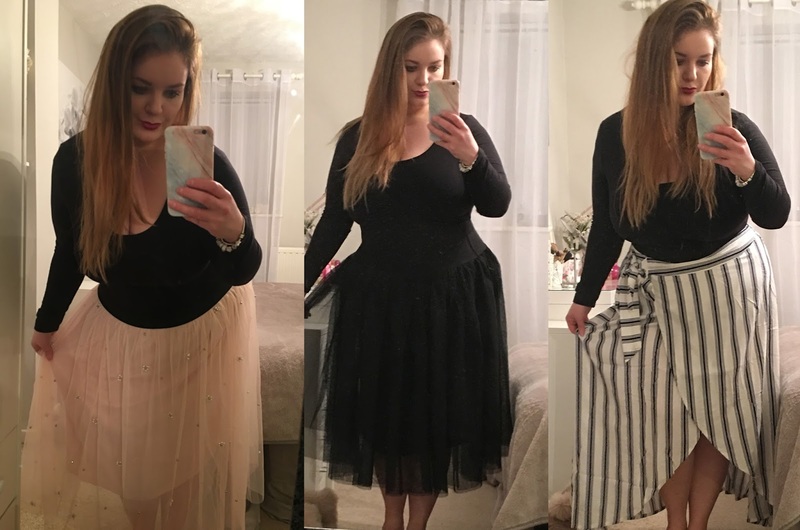 Before taking the plunge and trying some new styles I thought I'd have a little browse at some information online and see what would suit my particular shape, here's what I discovered. Hopefully it's helpful to any other plus sized hourglasses out there! The key to dressing any hourglass figure is to find a good balance between your top and bottom half, while accentuating your waist. I found that a-line skirts that are fitted at the waist and flare out look best on me, worn with a form fitting top. This long sleeve black top worked well with just about everything I tried, I definitely recommend snapping up something similar if you want to add some skirts to your wardrobe! The right fabrics will hang in a flattering way, for me the flowier fabrics definitely worked best and are well worth trying out if you have a similar shape. If like me your worst problem areas are your lower half, flowy skirts work well to hide what you don't like and accentuate what you do. I've gone out of my way to avoid anything too boxy or clingy, especially since I've gone with something more fitted on top. All of these styles work well if you don't want to accentuate your legs, but also don't want to wear tights or leggings underneath either. The tutu styles have a regular length skirt with sheer midi length fabric over the top which is a flattering way to show off your legs without getting them out completely. The wrap skirt is longer at the back and then shows off some leg at the front when you walk, but not in a big way. Much like a modern maxi skirt, it still looks pretty and feminine and shows a little, but you don't feel like you're desperately trying to cover yourself up. Do you have any tips for buying skirts with an hourglass figure?